During the 2012 electioneering campaign when then candidate Nana Addo Dankwa Akufo-Addo mooted the idea of a free senior high school, my heart leaped. I can bear witness to the free education introduced by Dr. Kwame Nkrumah and the challenges he faced when the programme was launched. I foresaw the challenges that Nana Addo would face as far as the issue of free SHS was concerned, if he happened to win the 2012 general elections. I have written in this column the challenges Osagyefo faced when he introduced the free education in the northern regions and how he solved them; hence I will not dwell on that again. The free education introduced by Nkrumah has been able to stand the test of time even though in the beginning there were some challenges. He might have thought of the challenges before introducing the programme, but as the sages say “history is made from bold ventures”. And today here we are with a free SHS nationwide and its accompanying challenges. As at the time he introduced the free education in the then two northern regions, the population of Ghana was barely five million people. Today, the population of Ghana has ballooned to a whopping 30 million souls. This clearly underscores the enormous task facing the current administration as regards the free SHS programme. In less than a month, schools will re-open to admit fresh students. 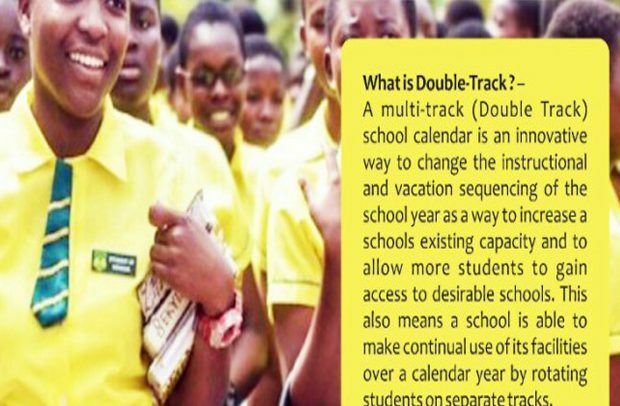 I am anxious to see how the double-track system will work but with the assurance given by the president that it is going to be the best option, coupled with comments in favour of the system by a brainy person like Mr. Kojo Yankah, a renowned academician and statesman, my anxiety has come down a little bit. According to him, the double-track system will rescue 180,000 students. It is all about perseverance, determination and will power. When Jacob cunningly “stole” the blessing which was supposed to be given to his brother Esau, their father Isaac told Esau not to worry because if he (Esau) persevered, he would prosper. True to the assurance given by Isaac, when the two brothers met after Esau had left to dwell somewhere out of anger, Jacob realized that what Esau had as his possession was more than what he (Jacob) had, even though he (Jacob) had the blessing of Isaac. Whereas majority of Ghanaians are anxious waiting to see progress and speedy recovery of the battered economy, the NDC nation wreckers are anxious to see the failure of the Nana Addo-led administration so that they will be voted to power to continue with the looting of state coffers. That is why they do not hesitate to criticize the current administration destructively. They have decided to close their ears and eyes and, in fact, refused to think about the good things that are happening under the new dispensation. To them, anything good that will benefit the good people of this country is a taboo and not worth commending. For example, take the issue of the contract signed between the government of Ghana and that of China. Ghana can boast of huge deposit of bauxite and from time immemorial this particular mineral has been exploited by foreign companies. Sadly, nothing can be shown to Ghanaians as some of the benefits from the extraction of the mineral. Recently, the Vice-President, Alhaji Bawumia, embarked on an expedition to China in search of strategic investors who would come down and invest in the extraction of our bauxite, add value to it and export the end product. A memorandum of understanding was signed and the dynamic vice-president flew back home to announce to the joy of Ghanaians that at long last the Chinese are prepared to come down to do business with Ghana as far as the extraction of bauxite is concerned. According to the terms of the agreement, the Chinese will in turn construct roads, interchanges, overhead bridges, roads, hospitals, etc. from what will accrue to mother Ghana. When the NDC heard the good news, they flew into tantrums and went haywire. When Bawumia referred to the transaction as barter, the NDC ignoramuses preferred to call it a loan, arguing that the deal would add up to the already ballooned national debt they recklessly piled up. Poor folks! They think by calling the deal a loan, Ghanaians will have sympathy for them. Their argument as to why it is a loan fell flat because even the first year JHS student understands what barter is. You see, these NDC failures are afraid of this particular deal which will bring a huge change in the lives of the good people of Ghana. And if that change comes, they will surely lose the 2020 general elections. For now, they are tickling themselves and shouting from the rooftop that since the NPP took over 18 months ago, the government cannot boast of a single infrastructure. If you sit in Accra and make such infantile analyses, the people who live in the small towns will laugh because they clearly see what is being done in their villages and towns. Someone out there should tell the NDC commentators that Accra is not synonymous with Ghana. In this world, it takes a big brain to bring big changes in the life of a nation. You don’t succeed if you don’t take chances. Some people even gamble with their lives and when success comes, fickle-minded people sit by the river and yet cry for water. Dinosaurs became extinct simply because they could not adapt the changing climate. Eighteen months down the line, the NDC people have not come into terms with the devastating defeat they suffered at the polls even though they had all the resources and state funds to go to war with the NPP. They have not come to understand that the slogan used by the NPP, “The Battle is the Lord’s”, contributed hugely to their defeat. If you are fighting an enemy and you tell the enemy that the battle is the Lord’s, you have already won the battle in advance. It was not for nothing that Joshua won all the battles he fought. Gideon would not win the battles he fought with a small army if the Lord’s mighty hand was not there to support him. Praise the Lord!! !